This badge was issued to Tushar Takate on 26 Jun 2018. 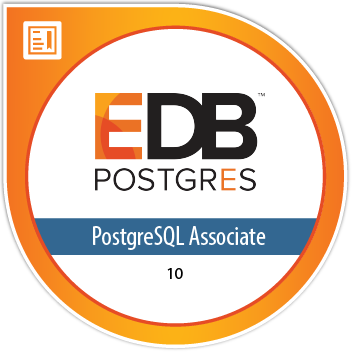 Earners of the EDB Certified Associate badge for PostgreSQL 10 have demonstrated their knowledge in administration of PostgreSQL open source databases. Earners have basic knowledge of PostgreSQL, including the system architecture and fundamental SQL, can install, create and manage databases, and have validated their ability to operate and maintain PostgreSQL database systems including how to backup/restore, and perform routine maintenance.